[Davross] pulled off an LED lighting build for his coral aquarium. The module consists of a wooden body holding a 3×16 grid of LEDs. They are mounted to heat sinks which themselves have cooling fans to help keep those puppies from melting. The system is controlled by an Arduino which allows for almost limitless lighting options. The photo above shows the LEDs running at 50%. He’s also taken some photos of the tank in “moonlight” mode. It’s a long and detailed forum thread but you can skip to some nice photos of the coral under the lights or details about the build. it looks nice but since this has ardunios, why didnt he use rgb leds and allow ANY color combo?? He spent about $1000USD on the lighting project. Not exactly a frugal person. Coral need very specific types of light. The real test is whether the coral is alive in 6 months. my only concern would be the specific lighting requirements for coral. most fluorescent lighting for critter tanks are made specifically to produce uv=b light, which is required for proper pet health. would be interesting to see how the corals algae react. Power leds work at low voltages and produce heat so they need heat sinks. Tropical fishes like the ones showed there need warm water to survive at different latitudes. What about using the led heatsinks as warmers? Sea water is highly dangerous for anything electronic, but I’m sure something could be arranged to eliminate those power hungry heaters and use the heat from leds. asdf thats what i was thinking, seal off the LED’s power contacts so you don’t get electrolysis or leach lead/etc. into the water, seal them off with something buoyant/ nontoxic foamlike sealant, since the tank is so shallow. and run your aerator tubes through the foam. no need for heatsinks, you got a large volume of heatsinking liquid to do that. or you could fully submerge the leds but theres alot of wireclutter & potential failure involved. What, no bud plants behind the aquarium? c’mon guys do a hydroponic fish food grow behind the tank. Saltwater aquariums are not cheap, nor are they easy to maintain. I suspect that if he has a saltwater coral aquarium, it is worth a lot more than the lighting is. Most people who go to the extreme on aquariums, are those who go saltwater. They are monster challenges, I have no idea if the LED set-up will work, but I am sure that if it does, you have eliminated a major headache when dealing with these types of set-ups. i was thinking to use water cooling like on computers. custom make some waterblocks or something. however, temperature control becomes a problem when the lights are still on the tank is hot enough. that and corrosion. salt water would kill most metals. i guess he could make a heat exchanger with reams of thin tygon tubing or something but it’d be awkward for sure. his solution is probably the most aesthetically viable. aquariums like that one are primarily about looks. How is spending more on the project worth not paying for the similar pre-built system that costs less? You can get LED or fluorescent/LED lighting rigs for aquariums that have both regular and moonlight mode. Some even have built-in timers. Also, Arduino is overkill for LED control. Sure there are cheaper ways to do this, but building your self exactly want you want is always worth the price of materials. From one bank-breaking builder to another, awesome project! Its pretty easy to point out the posts by people that don’t have saltwater tanks. First of all, those cheap ebay LEDs will not provide the intensity of light necessary for corals. Also, salt water aquarium are not usually UV-B spectrum. Most saltwater tank fixtures/bulbs are not in the UV spectrum at all. Also, for the tank the size the of the one pictured. $1000 sounds about right for DIY. You need intense lighting from multiple 3watt LEDs to provide the intense lighting necessary for corals. The fish don’t need much light, but the corals do. The manufactured LED fixtures comparable to the DIY in the photo run around $2000. Store bought lighting still lacks in many ways such as with a sunrise and sunset feature though some are now starting to show the capability. I will be curious to see how the corals fare long term. I replaced my actinic bulb with leds (and was careful to get something that matched spectrums as closely as possible) and I have noticed my coral suffer. I am giving it another 6 months and if I don’t see a change I am scrapping the leds all together. It is also notable that there are apparently there are patent issues and serious financial trouble for a few of the major companies that make the fixtures. Google “solaris patent issue” and you will find quite a bit on it. I don’t know about the coral health, but I went to a party recently and at these people’s house they had a setup where the pool light would change colors intermittently. I wonder if something like that could be adapted for a fish tank. The guy who did this has looked at a couple of the commercial LED lighting systems that were released *after* he finished his build. They appeared dimmer, and with less penetration at-depth through the water when compared with his custom rig. He has noticed that all but one of his corals are showing better growth under his LED array than when he was using a fluorescent system intended for corals. @therian – what exactly are you measuring that should cost over $1000? Lighting is usually one of the most expensive parts of a reef tank (along with a good protein skimmer) when done properly. I’ll address a few things here. Even at $1000 he is saving a large amount of money. Also, using both blue and white create the correct type of color temperature for corals at a fraction of the upkeep cost of metal halide or VHO T5’s. Not to mention with the correct lenses he is likely getting a better PAR rating than whatever his previous setup was. His dimming effect also helps regulate coral and fish spawning, as well as allow for nighttime viewing. If I wanted to just light a fish tank to grow plants using the least amount of power possible where might one find more information on it? My aquarium is in a corner and it doesn’t get enough light so the plants die, but I don’t like the idea of leaving the florescent light on either. CFL lights work really well and only draw a small amount of power. So long as your tank isn’t super deep. Are you sure this dosen’t make the fish go blind? Re. suggestions about using the heatsink to heat the water: I imagine tropical tanks need a good temperature control, and you won’t get that control from bathing heatsinks. There’s something called a Kelvin rating and I tell ya, this may look nice now but the actual degradation of the lights power will only be detected by the corals and not yer eye. Most MH lights last with the spectrum needed for 6 months before you can run them and watch that bubble coral receed. I had a 150 gallon about 17 inches deep. If you do weekly water changes you may be able to get that led to penetrate deep but it’s the two days that water is too murky for penetration that you’re away and those corals will die. Dude, the fish don’t care what color the light spectrum is! At least I never heard them complain. You might as well make some led uv sterilizers while yer at it. Beautiful design though. Which won’t mean pooh when yer rock dies. Remember live rock…not just live coral. Fish do not go blind from this light. The goal is to replicate the lighting as in nature. I guess fish don’t stare at the sun long enough to go blind. Live Rock is only called live rock because of the bacteria growth on the rock, which is highly desirable for biological filtration, but live rock does not need any light. The only exception is coralline algae growth on the rock which needs some light. Corals do not die after two days of poor lighting. Come on, think about it. These corals are sometimes shipped for several days in a box before they get any light. Also, in nature, we often have several overcast days with poor light. The corals do not die from that either. Further, a technique used in reefkeeping is to sometimes intentionally turn off all lights and have your tank in total darkness for 48-72 hours in order to kill off nuisance algae. This can be done once every month or two. The corals do not die from this either. There are such things as PAR meters that determine if light output is the proper spectrum and intensity for coral growth. LED lighting easily meets the demands of corals (when you select the proper LEDs). For all the nay-sayers, it does work, and it works well. I have been working with the reefing comunity for the last three years to help get DIY LED understanding where it is today. It takes a lot of LEDs, and a lot of power to be able to produce the right amount of light to properly support corals of all types. Davross did a great job on his build. Small, low power LEDs don’t cut it. Period. Even 1W LEDs really aren’t enough to get the job done on all but shallow (less than 12″) tanks. 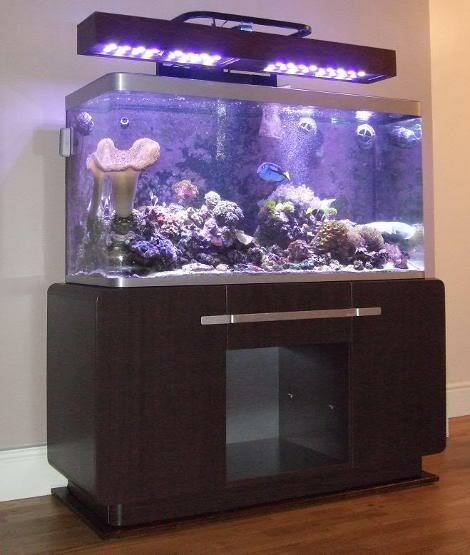 Take a read around the Nano-Reef forum if you want to see what LED setups we make. Get yer learn on! just my thought and pennies!!! Would u.v. leds be bright enough to make a u.v. sterilizer for marine tanks? I don’t think there are any UV LED bulbs in the proper spectrum. There are three spectrums of UV light: UV-A, UV-B, and UV-C. There are some UV-A LEDs available, but they have little to no germicidal effect. UV-C is the most germicidal. Since most traditional UV sterilizes are fairly low wattage (economical to run), I don’t see much advantage to an LED UV sterilizer.